only in the heavens and, whosoever makes a wish under this tree, gets fulfilled. In the Religious and ancient literature, we find a number of references to the Kalpvraksh, but no description whatsoever of its existence can be found anywhere in the world, except for only Kintur (Barabanki). Whereby this unique Parijaat tree of Kintur holds a special place in the world. In botanical terms, PARIJAAT is known as Adansonia digitata and has been kept in a special category, because it does not produce either its fruit or its seeds, neither can its branch cuttings can be planted to reproduce a second Parijaat tree. This is a unisex male tree, the botanist say, that there is no such tree anywhere else to be found. The leaves of this tree in the lower portion have five tips like the fingers of a hand, while at the upper reaches it has seven. Its flower is very beautiful and white in colour, on drying out it takes on golden tinge. This flower has five petals. This tree blossoms very occasionally, with very few flower, but when it does, that is after the 'Ganga Dashehra', spreads its fragrance far and wide. The age of this tree is said to be 1000 to 5000 years. The perimeter of the trunk of this tree is around 50 feet and height of around 45 feet. There is another popular saying that, its branches do not break or dry out but shrink and disappear into the original trunk. The nearby people consider it to be their protector and obliging, henceforth they protect its leaves and flowers at all costs. 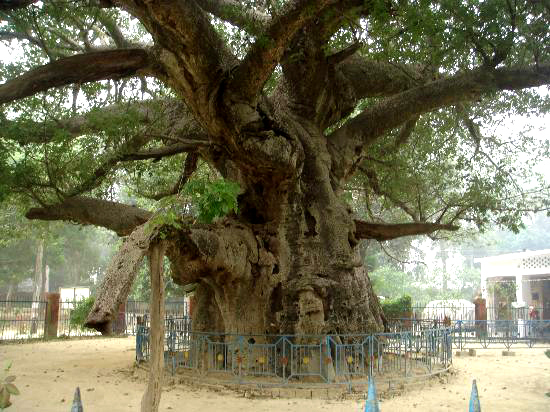 Local people hold it in high esteem, in addition to the large number of tourists who visit to see this unique tree.